A MINISTER EXTRAORDINARY TAKING PASSAGE & BOUND ON A FOREIGN MISSION TO THE COURT OF HIS SATANIC MAJESTY! The second of two prints surrounding the scandalous trial of Methodist minister Ephraim K. Avery for the brutal murder of factory girl Sarah Maria Cornell. (See "A Very Bad Man," no. 1833-13). 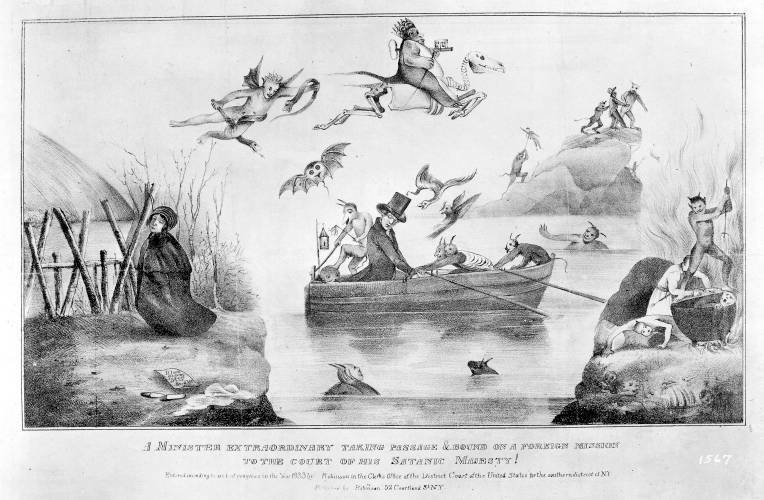 Contrary to Weitenkampf's suggestion that the print relates to Andrew Jackson, it is actually visionary portrayal of Avery transported to damnation by demons. Here Avery has departed the scene of his crime (left) where his victim, now expired, still hangs strangled from a post. Her shoes, kerchief, and a note reading "If I am missing enquire of the Revd. Mr..." lay nearby. As monsters fly overhead, Avery is rowed toward a shore at right where an inferno blazes and a man is boiled in a cauldron. Avery appears again in the upper right, being forcibly led toward a precipice.